My girl told me she and her friends are having a lunchtime Nordstrom party and I ask, "what's the occasion?" She tells me it's an anniversary. At first I thought I'd better run to get flowers, then I realized it's Nordstrom's Anniversay Sale. It looks like there are discounts throughout the store through August 4, and most are about 40% OFF. If you know the store you know we're talking about high fashion for all ages and genders. Clothing, bags, jewelry, even home and gift items are included. 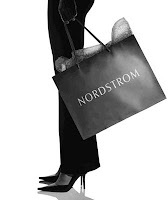 Click here to view the sale at Nordstrom.